The Havasu 95 speedway officially kicked off the second half of their 2015-2016 winter racing season last Saturday afternoon by observing a long standing tradition of ringing in a new year with racing on the first Saturday in January. The event, billed as "Racin" In The New Year". was sponsored by the Fraternal Order of the Eagles Lodge 4299 and featured on track action from the speedway's street stock, factory stock, team factory stock and bandolero divisions. The focal point of this particular afternoon was on the Get It In Gear Street Stocks who treated the fans to a special 75 lap, $1,000 to win, main event backed by a very healthy car count of 21 teams. The final results from this race clearly indicated that there is yet another long standing tradition in the making: Gavin Bucy scored his fifth, consecutive, win en route to his march towards a series' championship. The seemingly unbeatable Bucy crossed the start-finish line on lap 75 with a 1.009 second margin of victory over Bobby Keirns who scored his fifth, consecutive, second place finish. Bucy's excellent afternoon in Lake Havasu City-Arizona began with qualifying when he turned in a top speed of 16.384 seconds/54.932 MPH. There are five races remaining on the schedule for the street stocks. Despite Bucy's impressive string of five wins, the points race between Bucy and Keirns is still too close to call. Get In Gear Street Stock Stocks main event results: 1. Gavin Bucy 2. Bobby Keirns 3. Garrett Reinoso 4. Nathan Hovdal 5. Pat Petrie 6. Todd Seaver 7. Mike Sutterfield 8. Tony Forfa IV 9. Matt Larson 10. Scott Groom 11. Richard Selph 12. Anthony Forfa III 13. " Dave Is 72 Years Old"-(way to go Dave!) 14. William Guevara 15. Dwight Kelly 16. Ted Lamacki 17. Bryant Sutterfield 18. Thor Conley 19. Robin Gallaty 20. Rick Bezansen 21. Jeff Cleary. The fan favorite Sam Nichols Electric Factory Stocks were also a part of the racing action on this day and it appears that yet another Havasu 95 Speedway long standing tradition may be in the making. Brent Delay crossed under the checkered flag and scored his fourth, consecutive, division win while Chris Weiss followed him to finish second. Jeff Prieur won the heat race earlier in the afternoon. Sam Nichols Electric Factory Stocks main event results: 1. Brent Delay 2. Chris Weiss 3. Matt Caley 4. Chris Blackwell 5. Jeff Prieur 6. Dean Fleig 7. Stacey Cherco 8. Jeremy Orozco 9. Kris McCatlin 10. Richard Selph. In Maintenance Solutions Team Factory Stock action. driver Chris Weiss won the 15 lap feature by a margin of victory of 0.683 seconds over William Guevara. Weiss presented Team Take And Bake with their second win of the season and added some padding to their division points lead. Maintenance Solution Team Factory Stock main event results: 1. Chris Weiss 2. William Guevara 3. Tom Gram 4. Jeremy Orozco 5. John Bonzer. The youngsters in their small, but very fast, Bandoleros made their official season debut at the Havasu 95 and ran twin main events while racing for double points. There may have been two races, but there was only one driver who took the checkers. Allison Gay won the first feature, by a 5.049 second margin of victory, over runner up Ethan Deguevara. Later in the afternoon Gay scored here second feature win, by a 2.047 margin, over Brock Rogers. Gay also set the fast time in qualifying with a hot lap of 17.328 seconds/51.939 MPH. Bandoleros main event #1 results: 1. Allison Gay 2. Ethan Deguevara 3. Madison Gay 4. Brock Rogers 5. Amicleo Thompson 6. Cody Kimerly 7. Alex Bebe. Bandolereos main event #2 results: 1. Allison Gay 2. Brock Rogers 3. Madison Gay 4. Ethan Deguevara 5. Cody Kimberly 6. Amilceo Thompson 7. Alex Bebe. 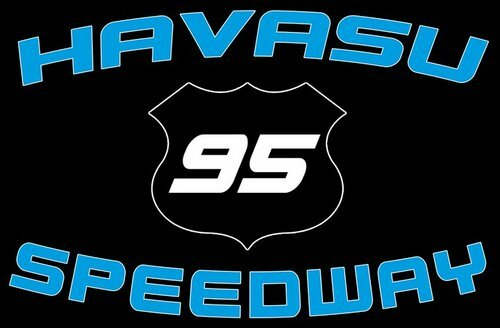 Racing returns to the Havasu 95 Speedway on January 16th featuring the Late Models running twin 50 lap features. Also on the race schedule will be the Get It In Gear Street Stocks, the Bandolero running twin 20 lap features, the Sam Nichols Electric Factory Stocks and the Maintenance Solutions Team Factory Stocks. Race time is 2pm.